The levels of damages from the recent Washington snowfalls were nothing like the widespread destruction of property and loss of lives from Hurricane Katrina. Still, the governments in the Washington area, while not facing a natural disaster of the same magnitude, showed a Katrina-like ineptitude. Heavy snow fell in my Maryland neighborhood from mid-afternoon on Friday, February 5, until late Saturday, February 6, leaving about 20 to 25 inches of snow. This was admittedly an extreme event that has happened only about 4 or 5 times in the past 30 years. It required state and local governments to show some real flexibility and an ability to devise new strategic responses on the fly. They failed! A Montgomery County snowplow did finally come through my neighborhood on the evening of February 7, actually sooner than I had feared. The real problem was the arterials. Even on Monday the 15th, while my neighborhood roads were showing bare pavement, nearby East-West Highway — a main thoroughfare for Montgomery County — was covered with layers of ice and snow. Only one lane was functioning in each direction. This entry was posted in State Policy and tagged Connecticut Avenue, East West Highway, hurricane katrina, John Berry, local governments, Maryland, Montgomery County, Washington Post on February 23, 2010 by Robert Nelson. People who live in New Jersey and New York already know that their property taxes are high. But they may not know just how high, that these two states have the highest property taxes in the United States, by various quantitative measures as described below. New York and New Jersey vie in any given year for first place for highest per capita homeowner property tax burden in the nation. The Tax Foundation recently published rankings of median per capita homeowner property taxes paid and 2008 is no exception. The top 10 counties are nearly split between the two states. Number one is Westchester, NY with a median per capita homeowner property tax of $8,890. When dividing the median property tax burden by median home value, only New York counties make the top ten. Niagara County is number one with median property taxes representing 2.89 percent of median home value. I decided to do another calculation using the Tax Foundation’s data and combining it with median homeowner income for each county in the U.S. to calculate another measure of property tax pain: how big a bite it takes out of homeowner income. Not surprisingly, the results don’t help either state. New Jersey has 16 out of the top 25 highest property tax counties (among counties with populations greater than 65,000) in the US. New York has six counties, and Illinois, three. For three counties in New Jersey — Passaic, Essex and Bergen — the median property tax represents over eight percent of median homeowner income. As a benchmark, the average for the US is 2.8 percent. New York has six counties in the top 25 in the eight percent range. It’s only by 21st place that a new state jumps into the rankings: Lake County, Illinois with a ratio of median property taxes to median income of 6.5 percent. Note that these are counties with populations of over 65,000. This entry was posted in Tax and Budget and tagged county, IL, Lake County, make, New Jersey, New Jersey Passaic, New York, Niagara County, NJ, NY, percent, tax, Tax Foundation, United States, US on October 20, 2009 by Robert Nelson. I recently drove across the Delaware Turnpike while traveling from Washington to New York. It had been a while so I didn’t remember that the toll had risen to $4 in 2008 – this for a road 11 miles long. It amounts to 36 cents for eac h of those 11 miles. This is ridiculous. The other tolls I paid driving up Interstate 95 were $2.50 for the JFK Highway in Maryland and $9.05 for the full length of the New Jersey Turnpike. The Maryland highway is 50 miles, and I drove 122 miles in New Jersey, amounting to 5 cents and 7 cents per mile, respectively. Other Northeast tolls are much like New Jersey and Maryland. Driving the full length of the Massachusetts turnpike covers 135 miles and costs $6.85, amounting to 5 cents per mile. The length of the New York Thruway is 376 miles, costing $17.50, also 5 cents per mile. The $28.45 toll for driving the entire 358 miles of the Pennsylvania Turnpike comes to 8 cents per mile. So how can Delaware get away with tolls 5 to 7 times higher than other nearby states in the Northeast? It is said to be the highest toll per mile in the United States. It helps that the Delaware Turnpike feeds into the Delaware Memorial Bridge, one of the few ways of getting across the Delaware River. There are no good alternative routes if you are traveling up the east coast. Once on the New Jersey side of the river, by contrast, it is easy to take Interstate 295, a toll-free road which allows you to bypass at least half of the Turnpike. This entry was posted in Public Finance, Transit and Transportation and tagged Delaware Memorial Bridge, Delaware River, Delaware Turnpike, Germany, Holy Roman Empire, interstate highway system, Maryland, Maybe Delaware, New Jersey, New Jersey Turnpike, New York, New York Thruway, Pennsylvania Turnpike, Rhine River, state budget, Turnpike Delaware, United States on September 21, 2009 by Robert Nelson. Quorum is the monthly magazine of the Washington chapter of the Community Association Institute. The magazine often has useful articles on the management issues confronting homeowners associations, condominiums and cooperatives – the three forms of private community association – in the Washington area. The September 2009 issue includes an article by Randal O’Toole of the Thoreau Institute in Oregon usefully reminding us of “The Consequences of Urban Planning: How ‘Smart Growth’ Sprouts Bad Outcomes” (not yet available online). Another interesting article describes how private neighborhood “Creativity Solves Persistent Painting Problems” in a homeowners association (HOA) of townhouses in McLean, Virginia. When neighborhood property owners have private control over their own environment, they are able to innovate pragmatic solutions to neighborhood problems that would be more difficult, or unavailable altogether, under zoning and other public forms of neighborhood collective controls. In 1985, the McLean HOA board of directors passed a rule requiring that each townhouse be painted every three years with pre-approved colors (this seems a short time to me, but the association presumably had its reasons). This led to a variety of practical problems, including owners who failed to meet the deadline, owner selection of lower quality paints to cut costs, and poor color coordination when each owner individually exercised their choice (if within the range of allowed colors). In order to address these problems, the McLean HOA in 1999 adopted the following approach: in the year when a townhouse owner is scheduled to repaint, the HOA issues a paint voucher good for use at a particular local store. The voucher – covered by the HOA through its dues assessments — is only good for a top-quality national brand of paint and has an expiration date, creating a strong incentive for the owner to act within the HOA’s schedule. The owner does the painting or hires someone to do it. Assuming they use the voucher, all owners now use the same paint color, eliminating the former problem of clashing colors. Additional benefits are a lower contractor rate for paint that the HOA has been able to negotiate with the store and the increase — reflecting the new higher paint quality — in the painting interval from three to four years. Under public sector control of a neighborhood environment, rigid zoning and other rules would be administered by officials outside the neighborhood itself. Once set in place, it would be difficult to make any changes in public rules based on subsequent neighborhood learning experiences. The neighborhood property owners themselves do not hold the responsibility for collectively managing their own surroundings, and thus have less incentive to search for practical solutions to their common problems. If they do come up with a good idea, they face the hurdle of having to sell it to the outside public administrators who hold the final authority. The Sky Bryce Association in the Shenandoah Valley similarly faced a practical problem and was similarly able to innovate a creative solution. According to its founding documents (its “neighborhood constitution”), changing the rules of the association required not only a certain favorable percentage of owner votes but a certain absolute total number of votes. Even in the case of non-controversial changes to the association rules, the association had tried but failed to obtain the required total number of votes. The Sky Bryce HOA, like the McLean HOA with its painting problem, came up with a clever solution. It turned the HOA voting into a lottery as well. The first selected “vote/ticket” offered a prize of $300, second place was worth $200, and third place $100. By appealing to their gambling instincts, owner voting in the HOA increased and the rules change was easily approved. In the public sector, even assuming public administrators had shown the same creativity, it would probably have been impossible to use a similar lottery procedure — it is not considered acceptable (legally at least, whatever the old political machines used to do) to “pay” people to vote. A private neighborhood gives owners the opportunity to manage their own surrounding environment. Neighborhood environmental management in the public sector is by outsiders and is likely to be less creative and flexible. Although HOAs and other forms of private community association now predominate in brand new developments of any size throughout the United States, there remains the problem of introducing private creativity into the many old neighborhoods that lack a private collective management regime at present. This entry was posted in State Policy and tagged community, Community Association Institute, HOA, make, United States, vote on September 8, 2009 by Robert Nelson. In July 2009, a three-member panel of the federal court of appeals for the District of Columbia effectively ruled that well-off suburbanites are entitled to protect themselves from crime and other serious threats but residents of poor neighborhoods are not. Gated communities have spread across the United States since the 1970s. By some estimates, more than 8 million residents lived in 20,000 gated communities in the late 1990s, and the numbers have increased rapidly since. Gated communities impose tight controls on neighborhood access, requiring non-residents seeking entry to show that they have a reasonable purpose. As the federal appeals court acknowledged, a wave of “violence… has plagued the Trinidad neighborhood in Northeast Washington, DC for many years.” Conditions had reached the point in early June 2008 that there had been 25 recent assaults involving firearms, resulting in 5 deaths. On May 31, 2008, the neighborhood experienced a triple homicide. If this had been the suburbs, the National Guard might have been called out. This entry was posted in Crime and tagged Caneisha Mills, community, David Sentelle, Maryland, National Guard, Northeast Washington, Oscar Newman, United States, Virginia Supreme Court, vote on August 24, 2009 by Robert Nelson. How about letting local neighborhoods charge tolls on outside drivers for the use of their immediate streets? It is now technologically fully feasible with EZ passes or other devices. This idea occurred to me as I was thinking about a recent controversy in Montgomery County, Maryland over neighborhood speed bumps (or “speed humps” as they are sometimes called). Speed bumps in Montgomery County, like much of the rest of the country, have proliferated — now totaling 1,200, amounting to one bump per 2.2 miles of road. While many neighborhoods like them, they infuriate others. They also pose problems for fire and other emergency vehicles. In 1998, responding to rising complaints, Montgomery County initiated a new policy to make it more difficult to use speed bumps. Since then, 388 out of 653 proposed speed bumps have been approved. In this case, a request for bumps was made by the Springfield Civic Association and involves a section of Cromwell Drive in Bethesda that has become popular with harried commuters. A vote of the 38 households directly involved would be required, and approval would require an affirmative 80 percent supermajority. This entry was posted in Transit and Transportation and tagged community, Cromwell Drive, EZ, make, Maryland, Montgomery County, Springfield Civic Association, United States, vote, Washington Post on July 25, 2009 by Robert Nelson. 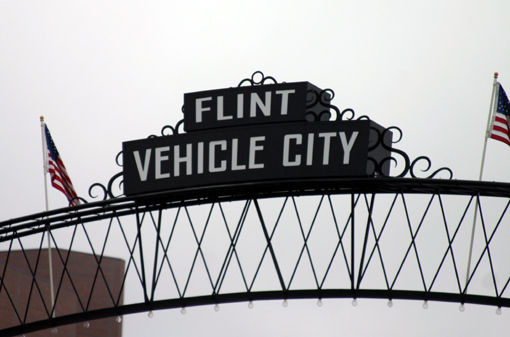 According to a recent article in the British Telegraph, Flint, Michigan once had 79,000 workers for General Motors and now has 8,000. The population of the city has fallen from 200,000 to 100,000. The unemployment rate is 20%. Young people are leaving in droves in search of jobs and better prospects elsewhere. Large parts of the city are emptying out, leaving at least 4,000 abandoned homes. Although the city has demolished 1,000 of them, 3,000 remain standing. Whole neighborhoods are crumbling rapidly. So what to do? The normal political response is to take public actions to “save” places like Flint. The urban renewal programs 50 years ago were designed to arrest the decay of older American cities such as St. Louis and Detroit – typically built in the nineteenth century and with decaying housing stock and outmoded land use patterns based originally on streetcar systems of transportation. Many federal billions were spent in futile efforts to reverse the market verdict, reflecting a refusal to accept that these old city neighborhoods were outmoded and their highest value economic use was as cheap housing for poor people. A “slum” was a pejorative term in those days for old housing – in many cases not all that bad structurally – that people with lower incomes could afford. But for American politicians, every part of every city should be thriving. If not, the government had to do something. Reflecting the failures of past programs to “revitalize” the inner cities, the Brookings Institution now identifies 50 cities, most of them in the industrial “rust belt,” that need to shrink significantly to survive. After decades of failed efforts to halt downward economic forces, there has been a new acceptance that some American cities simply must get smaller. Facing its dire problems, city planners in Flint have finally come to accept this. The current economic crisis and the large number of foreclosures emphasize the need to rethink urban strategies that automatically assumed upward growth for every city. One Brookings study proposes that the government adopt a program of “land banks” – government would acquire the land in old declining neighborhoods and then turn it over for redevelopment. It sounds unfortunately like of the thinking that was on exhibit in New Haven, Connecticut, leading to the Kelo Supreme Court case. A much better approach would be to leave redevelopment to be determined in the market by the collective actions of property owners in a neighborhood area and land developers. Property owners could be facilitated in organizing a collective land bargaining association that would then solicit developer bids for the whole neighborhood. If a high enough bid was forthcoming, and if a large supermajority of property owners – say, 80 percent – voted to accept the offer, the neighborhood would be turned over to the private developer. A whole new neighborhood land uses compatible with present day market economics would result. It is possible that in places like Flint, a few neighborhoods might even be turned back to urban farming of high value local products. Whatever the result, market forces rather than urban planners would decide. This entry was posted in Infrastructure and tagged British Telegraph, Brookings Institution, Flint, General Motors, growth, incomes, Kelo Supreme Court, New Haven, One Brookings on June 15, 2009 by Robert Nelson. Robert Lerman, a fellow at the Urban Institute in Washington, has an interesting proposal in the February 27 issue of the Washington Times. Lerman notes that around 2 million low-income households are now receiving more than $20 billion per year in total rental subsidies from the federal government. For example, a household might rent an apartment for $800 per month, and pay only $300 out of its own pocket, while the federal government picks up the remaining $500. Lerman’s suggestion is simple. Partly because of the depressed housing prices today, if the federal government kept up the same level of payments, it would be financially workable for these households to purchase a home with the same amount of money – or often less – that is now going to rents. In Detroit, for example, a typical house in a lower to moderate income neighborhood now sells for around $70,000. At current rates, paying off a 30-year mortgage would cost about $400 a month, leaving up to the remaining $400 (from the $800 now being spent on rent) to cover taxes, maintenance, and other home costs. With much of the mortgage payment in effect guaranteed by the federal government, a small down payment might be possible. Under this idea, many new households might be able to join the ranks of homeowners without any additional costs to the government. And if large numbers of households pursued this course, it might also help to stabilize currently stressed housing markets and prices in many cities across the United States. Errata: This post originally showed Daniel Rothschild as the author. It is Bob Nelson. This entry was posted in Uncategorized and tagged Bob Nelson, Daniel Rothschild, United States, Washington Times on March 5, 2009 by Robert Nelson.